After his son’s life was cut short two years ago in a tragic car accident, Carlos Arraya, CGCS, decided to make the most of his relationships. Some superintendents love their work because they get to be outdoors, or for the pleasure of seeing the sunrise each morning. Sunrises are nice, but they aren’t what get Carlos Arraya, CGCS at Bellerive CC in St. Louis, out of bed early every morning. He loves his job for one reason: the people. It’s not that he specifically loves his crew (though he does). Arraya is like Rod Tidwell at the end of Jerry Maguire… he loves everybody. Even if he weren’t preparing for the 100th PGA Championship — put him in a blue vest greeting customers at Walmart, he says — it would still be about people. Arraya’s always been a people person. That’s why it was so hard when he lost one of the most important people in his life. The 100th PGA Championship opens play on Monday, Aug. 6. It’s a significant date for everyone at Bellerive and at the PGA of America, but for Arraya, that date has a larger meaning than any golf tournament, even the major playing at his course. Aug. 6 would have been the 21st birthday of his son Isaih — whose life was cut short two years ago in a tragic car accident in Florida. Zeke Arraya in July 2016, giving the thumbs-up to his boss Rusty Wilson at Tranquilo GC in Orlando. Isaih, called “Zeke,” followed his dad into the business. Arraya had just recently been promoted at Bellerive when the accident happened. Arraya is happy to talk about turf types and major championship pressures in a hot and humid St. Louis climate (more on these topics shortly), but the tragedy of losing his son redirected his energy into people. 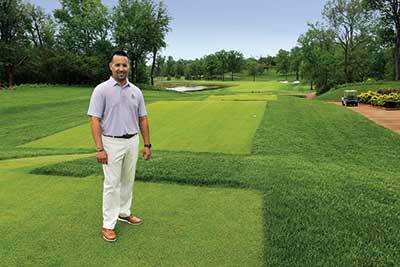 He’d rather talk about culture, about helping people succeed, than getting Bellerive’s Meyer zoysiagrass fairways perfectly firm for the best players in the world. She sets her cynicism aside when it comes to the culture at Bellerive. Like the rest of the crew, she’s bought in. inverted pyramid. His team is at the bottom, not top. Arraya worked at Bellerive for a year under his friend and mentor John Cunningham, CGCS, director of agronomy. When Cunningham accepted the general manager/COO position at Aronimink GC in Philadelphia, it opened the door for Arraya. Cunningham and Arraya first worked together 15 years ago in Florida at Black Diamond Ranch in Lecanto. Cunningham became certified while at Black Diamond, and Arraya, then an assistant, approached him about wanting to achieve the title of superintendent. 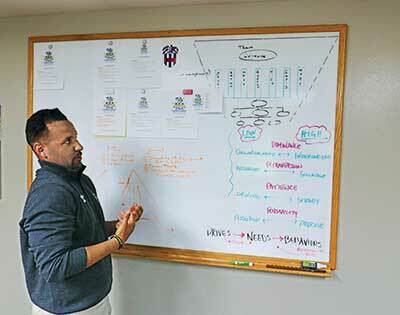 The first thing Arraya did after Cunningham left for Aronimink was assemble the leadership team around the dry-erase board in his new office. He wrote the word “culture” and asked his team to define it. The answers varied, but a common theme was family, communication and being trustworthy. “I knew we would struggle with the recruitment of labor. I knew we were going to struggle with the weather,” Arraya says. “But we will not struggle with each other, period. All of them connected to being open and having honest conversations. Arraya also believes that a good culture necessitates a proper work/life balance. He wants his crew members to spend more time with their families than with Bellerive’s fairways. He wants the same for the entire industry. The course’s motto is “Led by legacy,” and that legacy has brought an all-star crew of up-and-comers to the course, including assistant superintendents Jared Brewster (previously at Augusta National and Victoria National), Nick White (previously at Alotian Club and the National Golf Club of Kansas City) and the young Matthew Lennon, returning to the site of his internship after graduating from Michigan State University last spring. St. Louis is well known for its hot, humid summers. The greens at Bellerive are A-4 bentgrass and the fairways are Meyer zoysiagrass, which can thrive in the heat with aggressive management. It’s all hands on deck when temperatures surpass 90 and humidity rises, says Assistant Superintendent Jared Brewster. 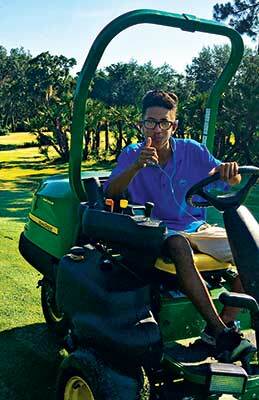 Arraya loves what he calls the “newborn feeling” of seeing the course getting freshly manicured each morning. But it’s all secondary to seeing his crew each morning rolling in to punch the clock. Arraya rarely has a bad day anymore. His perspective has changed since the death of his son. There is good news, he says: Six people on the Bellerive staff are expecting babies. One of those babies is due on Isaih’s birthday. The 2018 PGA Championship tees off Aug. 6. 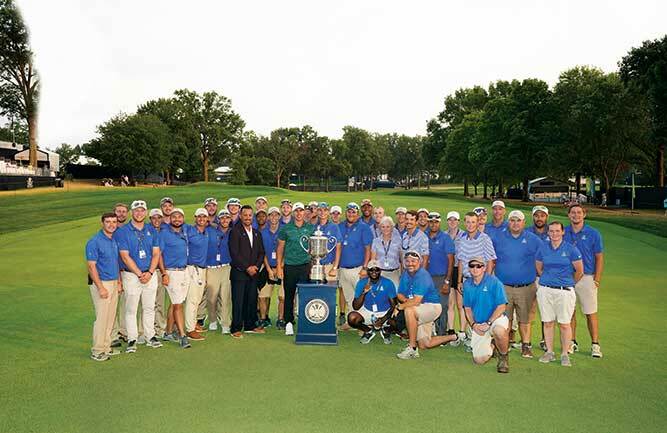 For more on the 2018 PGA Championship preview, check out the stories of a few of the championship’s some 150 volunteers.